The University College Hospital (UCH), Ibadan, Oyo State, says it is implementing some strategies that will address the issues of medical tourism and brain drain in the health sector. Nigeria's health sector needs reform, a situation that is evident in the amount spent on medical tourism yearly. At least $1 billion is lost yearly to medical trips abroad by Nigerians. Even the President, Muhammadu Buhari, had benefited from this growing trend and a former Vice President, Dr. Alex Ekwueme is in London for medical treatment at the moment. Many doctors have left the shores of Nigeria to nations where they will practice medicine and also have the opportunity to grow in terms of knowledge. 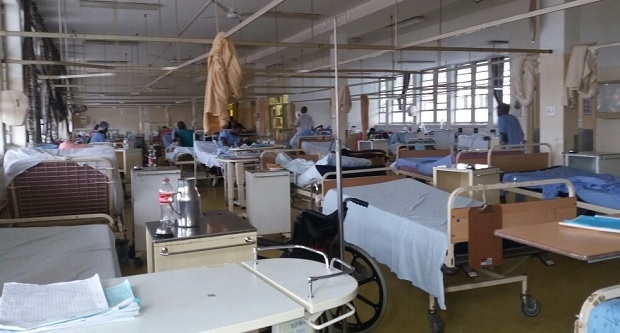 Several attempts to address these issues in the sector have not yielded needed result, but the University College Hospital (UCH), Ibadan, Oyo State, says it is capable of resolving the medical tourism challenges and brain drain plaguing the nation’s health sector. Professor Temitope Alonge, the Chief Medical Director of the hospital, made the assertion on Monday at a news briefing to herald the week-long activities lined-up for the 60th anniversary of UCH. According to him, UCH has now become a stop-gap between the private and general hospitals in the country through intervention in form of private suites for those who patronise the private health facilities. "The advantage of private suites for patients is that it offers facilities, equipment and qualified specialists in various fields to attend to their needs at a specified cost. "At the same time, we still handle other needs of patients in the area of general provision of healthcare services they require," he said. Alonge explained that private suites were designed to render quality healthcare services to those who could afford to pay. "Private suites have separate laboratory, ultra-sound, diagnostic centre, operating theatre as well as executive suites. Morphine is a pain medication of the opiate type which is found naturally in a number of plants and animals. "It acts directly on the central nervous system (CNS) to decrease the feeling of pain. It can be taken for both acute pain and chronic pain. "Morphine is frequently used for pain from myocardial infarction and during labour," he explained. Alonge also said there were other units in the hospital taking care of special cases like the Tony Anennih Geriatric Centre. The hospital is working on a Geriatric Rehabilitation Centre which will be inaugurated during the week-long programme and a Paediatric Intensive Care is also under construction.